South Carolina Power of Attorney Forms provide a legal method by which an individual in South Carolina can officially designate another person with the authority to act on his or her behalf. Naturally, the matters where the designated agent may represent this individual (principal) must be determined and approved beforehand by the principal. Different powers of attorney will enable the issuing principal to designate authority in different subject matters. These documents cover a broad range of powers. Some allow an individual to convey broad powers to another, while others are for more specific purposes. In each case, it is important to consider who will be the person that is appointed. Factors that should be considered include integrity, reliability, availability, and expertise. Durable Power of Attorney – This form allows an individual to appoint a representative to represent them in financial matters for an extended period of time, including beyond the time when the person who has made the appointment can no longer make their own decisions. 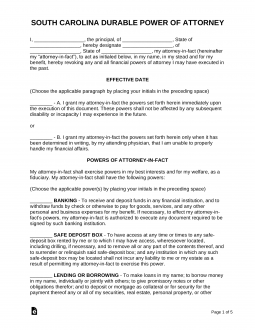 General Power of Attorney – This form is similar to the durable form because it allows the individual to appoint a representative to represent them with their financial affairs, however, this appointment ends if the person making the appointment is deemed incapable of making his or her own decisions. Limited Power of Attorney – This form is for appointing a person to handle an individual’s matters related to a temporary situation or limited transaction. Medical (Health Care) Power of Attorney – This form allows an individual to appoint a loved one to be in charge of their health care in the event they cannot communicate their wishes. Guardian of Minor Power of Attorney – This form allows an individual to appoint a caretaker or guardian to take care of their children for a temporary period of time. Signing Requirements: Not specifically stated; however, it is recommended that the power of attorney be signed by the caregiver, two (2) witnesses, and a notary public. Real Estate Power of Attorney – In accordance with § 62-5-708, an individual may create this document under a special jurisdiction to allow someone else the power to handle real property. Revocation of Power of Attorney – This form is for use when you want to terminate a pre-existing power of attorney. Make sure that your agents know that you are canceling the POA. Signing Requirements: Not specifically stated; however, it is recommended that the document is notarized. Tax Power of Attorney (Form SC-2848) – This form allows an individual to appoint a person, often an accountant, to handle their tax matters with the tax authority. Vehicle Power of Attorney – This form allows an individual to appoint another person to handle any matters relating to titling and registering that come before the South Carolina Department of Motor Vehicles.